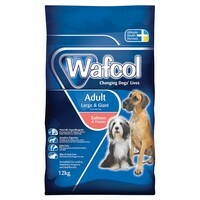 Wafcol Salmon and Potato Adult Dog Food For Large and Giant Breeds helps the wellbeing of a normally active dog, providing all the necessary nutrients to keep dogs fit, healthy and happy throughout their lives. It has been specially formulated to be gentle on sensitive digestive systems with salmon as the single protein source and potato as the main carbohydrate source. Made with no cereals such as wheat, wheat gluten, maize, barley, rye and oats and also excluding red meat, poultry, white fish, dairy products, soya, artificial colours, flavourings and preservatives, this Wafcol Salmon and Potato is the perfect choice for dogs who suffer from intolerances and food allergies. This delicious food contains prebiotics which are proven to help improve digestion and Omega 3 & 6 fatty acid, iodine rich seaweed which are all necessary for many functions including growth, repair of tissues and to help promote a healthy coat and skin. 37% Salmon (includes 27% Salmon, 7% Salmon Meal, 2% Salmon Gravy and 1% Salmon Oil), 37% Potato (includes 23% Sweet Potato and 14% Potato), Peas, Sunflower Oil, Lupins, Pea Protein, Minerals, Vitamins, Mannan-Oligosaccharides (1800mg/kg), Fructo-Oligosaccharides (1800mg/kg), Seaweed, Glucosamine (320mg/kg), Methylsulfonylmethane (MSM 320mg/kg) , Chondroitin Sulphate (225mg/kg). Crude Protein 24%, Fat Content 10%, Crude Fibres 3.5%, Crude Ash 8%, Calcium 1.1%, Phosphorous 0.9%, Omega-3 Fatty Acids 1.0%, Omega-6 Fatty Acids 3.0%.